Explanation: First, a new truss was added. Then, new solar panels were installed. Now, as part of the planned upgrade of the International Space Station, an Expedition 18 astronaut has upgraded her own head. 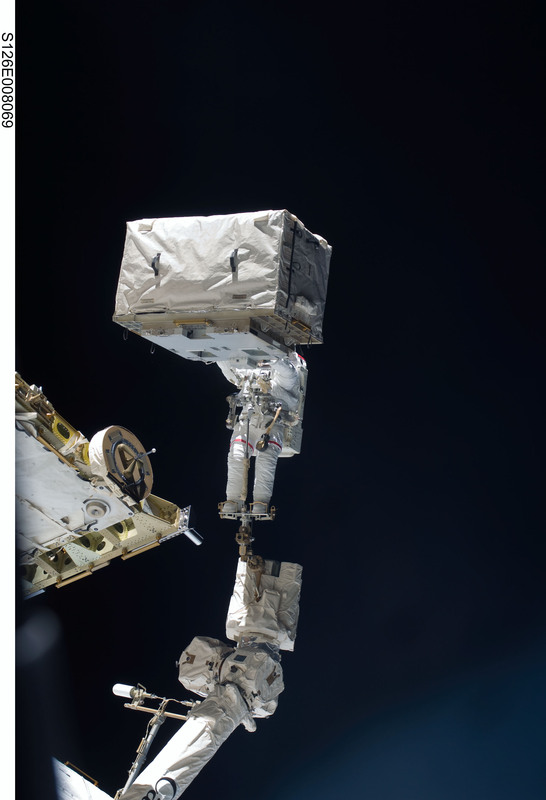 The Human Extended Analog Device 9000 was attached with only minor delays, making the astronaut's remaining spacewalks over 40 percent more efficient. With the HEAD 9000 attached, an astronaut can now directly access 4 Gigabytes of computer flash memory with their own brain, perform complex mathematics by "directed thinking", and play a pre-installed game of Tetris at no additional charge. Happy April Fools' Day from the folks at APOD. In reality, the space shuttle Discovery's mission to upgrade the International Space Station ended Saturday after upgrading only the space station. The above image of astronaut Heidemarie Stefanyshyn-Piper handling the box-like Nitrogen Tank Assembly was actually taken last November. For some reason, however, Astronaut Stefanyshyn-Piper can now factor 11 digit prime numbers in her head.